Western blot analysis of extracts from HeLa cells, transfected with 100 nM SignalSilence® Control siRNA (Unconjugated) #6568 (-), SignalSilence® β-Catenin siRNA I (+) or SignalSilence® β-Catenin siRNA II #6238 (+), using β-Catenin (6B3) Rabbit mAb #9582 (upper) or α-Tubulin (11H10) Rabbit mAb #2125 (lower). 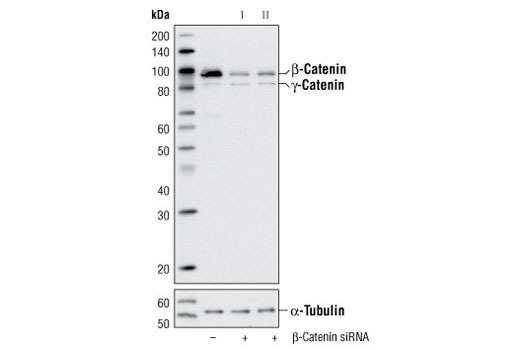 The β-catenin antibody confirms silencing of β-catenin expression, while the α-tubulin rabbit mAb is used is used as a loading control. Western blot analysis of extracts from HeLa cells, transfected with 100 nM SignalSilence® Control siRNA (Unconjugated) #6568 (-), SignalSilence® β-Catenin siRNA I (+) or SignalSilence® β-Catenin siRNA II #6238 (+), using β-Catenin Antibody #9562 (upper) or α-Tubulin (11H10) Rabbit mAb #2125 (lower). The β-catenin antibody recognizes both β-catenin and γ-catenin and demonstrates the specificity of β-catenin expression silencing. The α-tubulin rabbit mAb is used is used as a loading control. CST recommends transfection with 100 nM β-Catenin siRNA I 48 to 72 hours prior to cell lysis. For transfection procedure, follow protocol provided by the transfection reagent manufacturer. Please feel free to contact CST with any questions on use. 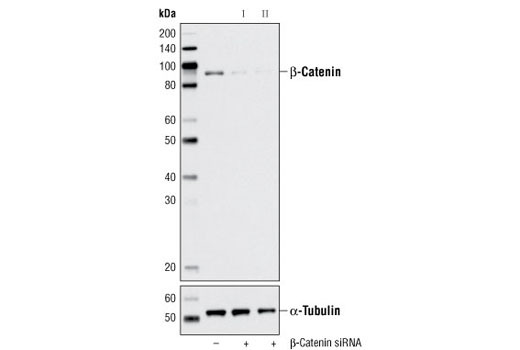 SignalSilence® β-Catenin siRNA I from Cell Signaling Technology (CST) allows the researcher to specifically inhibit β-catenin expression using RNA interference, a method whereby gene expression can be selectively silenced through the delivery of double stranded RNA molecules into the cell. All SignalSilence® siRNA products from CST are rigorously tested in-house and have been shown to reduce target protein expression by western analysis. β-Catenin is a key downstream effector in the Wnt signaling pathway (1). It is implicated in two major biological processes in vertebrates: early embryonic development (2) and tumorigenesis (3). CK1 phosphorylates β-catenin at Ser45. This phosphorylation event primes β-catenin for subsequent phosphorylation by GSK-3β (4-6). GSK-3β destabilizes β-catenin by phosphorylating it at Ser33, Ser37, and Thr41 (7). Mutations at these sites result in the stabilization of β-catenin protein levels and have been found in many tumor cell lines (8). Cadigan, K.M. and Nusse, R. (1997) Genes Dev 11, 3286-305. Wodarz, A. and Nusse, R. (1998) Annu Rev Cell Dev Biol 14, 59-88. Polakis, P. (1999) Curr Opin Genet Dev 9, 15-21. Amit, S. et al. (2002) Genes Dev 16, 1066-76. Liu, C. et al. (2002) Cell 108, 837-47. Yanagawa, S. et al. (2002) EMBO J 21, 1733-42. Yost, C. et al. (1996) Genes Dev 10, 1443-54. Morin, P.J. et al. (1997) Science 275, 1787-90.